Our birds will accent your special day. We offer various options and will accommodate all extended needs. Photo Opportunities Upon the conclusion of your ceremony, our raptors will be available for photo opportunities with guests allowing the memory of their majesty to last forever. Personalize your very special day with an unforgettable themed wedding ceremony. Raptor Events will tailor our presentation to fit your needs. Let us know your theme so that we may best accommodate your special day’s requirements. Previous themes include Scottish, Medieval, and wizard ceremonies. Raptor events has a wide variety of animals on hand to contribute to a memorable ceremony or reception. 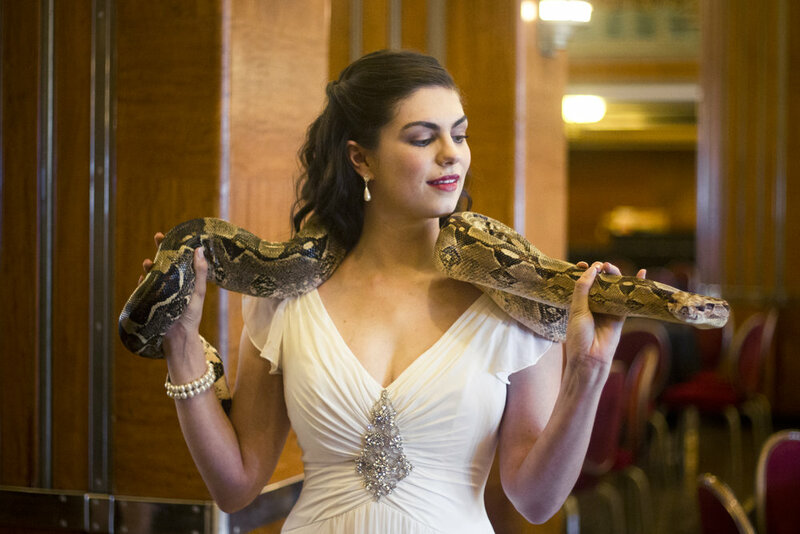 Add more value to the occasion with the addition of our unique reptiles. Our handlers are trained to answer any questions you or your guests may have about our marvelous animal companions. Add an elegant and romantic touch to the conclusion of your wedding ceremony with a dove release. Our doves can be released as you exit your venue, or in the case of an outdoor ceremony, their flight can coincide with the pronouncement of your marital union. Your ceremony will be enhanced by a moment to symbolize your undying love and affection as our doves watch from high above. Prices may vary based on location and venue accessibility. Travel distance over 15 Miles is $0.95/mile.